Overwhelmed by specifications for PDA's? Wondering what it all means to you? This multipart feature will address four components of a PDA, what they mean to you, and how to compare different products specifications. Unlike many pages on this site and others like it, everything here will be explained in simple terms (almost all plain English). Each section will assume that you have little to no technical knowledge and will hopefully build up your knowledge so you can better find a PDA that is right for you. Simply put, the processor is the decision maker of a computer. The processor handles and manipulates data, inevitably allowing your device to do things. Generally, we call one of these manipulators a cycle. The more cycles in a second, the faster we say the processor runs. Most often you would see this speed measured in megahertz (abbreviated MHz). One megahertz is one million cycles per second. If a PDA's specifications say it has a 300 MHz processor, that means that every second the processor completes three hundred million cycles. This is all well and good, but it is not like you would ever really see your processor completing these cycles. Now you should at least see that the number we assign to a processor as its speed has to do with how fast it does its job. The processor is not the only component in a PDA (or computer for that matter) which deviates how fast the device runs, but it is the most common factor we have to measure device speed. In most cases a faster processor will mean that your device can do things faster. A faster processor does not always only have added benefits. More often then not, faster processors require more power. Having a faster processor where it is not needed means that a devices battery may die quicker or the device includes a larger battery (which may add to cost and/or size and weight). A higher processor speed is something that many users desire, but is not always needed. Consider what you would most often use your PDA for. If you want the device to be a planner replacement, then your device will not have to do much processing and a faster processor is only going to help to lower battery life while not really improving productivity. If you want the device to be able to play music, movies, surf the internet, or play advanced games, your device will have to process lots of data so it can display that data to you visually and/or audibly. In this second case, a faster processor would still drain the battery like in the first case, but it also would actually be used so you could adequately perform the functions required (or desired). Unlike other functions of a PDA, processor specifications cannot always simply be compared between multiple products. If devices run different operating systems (Pocket PC, Palm OS) there could be a variation in speeds because of their different designs. One may require a faster processor to run while the other a slower. Because of this you should stray from primarily comparing processor speeds of devices with differing operating systems. Increased processor speed will increase power (battery) consumption, and will increase the devices overall price. A PDA's memory is used different then in a desktop or laptop computer. PDA's contain two types of memory. The first is known as RAM, which stands for Random Access Memory. RAM is volatile solid state memory or volatile flash memory. That means it requires power to keeps its data (volatile) and it has no moving parts (solid state or flash). The second type of memory is known as ROM, which stands for Read Only Memory. Unlike RAM, ROM is non-volatile, meaning that it does not need power to retain the data stored on it. The amount of memory (RAM or ROM) available to be used by the user for storing data is measure is megabytes (abbreviated MB). A standard floppy disk can hold 1.44mb of data while a compact disc can hold up to 700mb. This is why compact discs are a preferred method of storage. Similarly, a PDA with more memory can store more data and is often desired. RAM is used by PDA's for two things, unlike in a desktop or laptop computer where RAM only is used for one. The first thing PDA's use RAM for is storage (desktops and laptops do not use RAM for this). When you save a document or install a new program, storage memory is used. The file or program data is written to the RAM where it can then be accessed again until it is deleted. 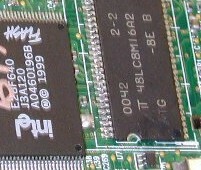 The second thing PDA's use RAM for is as program memory. Program memory is not for the storage of programs (software) as those are stored in storage memory. Program memory is used when programs are run or files are opened. As a user, you have no control over the data in this area as it is constantly changing (unlike storage memory which only changes though actions by you). Both storage and program memory are RAM, which means when the amount of RAM for a device is specified, that amount is divided between storage and program memory. Often this division can be modified by you as the user, but inevitably a device that is said to have 64MB of RAM maybe only have 54MB (or less) available for storage of programs and data. ROM is used by PDA's for two things (in some cases). The first thing all PDA's use ROM for is the storage of the operating system. The reason for this is so that you will never have to install the operating system. The ROM cannot be erased by the user (hence why it is called Read Only Memory) so it is not like a desktop computer where you could accidentally delete system files. This also means that you can not always simply upgrade the operating system. Only devices that state the have Flash ROM's (writeable ROM's) can have permanent upgrades offered for them. The second thing that some PDA's allow ROM to be used for is file storage by the user (once again it must be a Flash ROM). In this case there is unused ROM available and the operating system allows the user to choose files or programs to write to the ROM. Though they can be erased by you, the files will not be lost if the devices batteries files like they would if they were in RAM. When comparing multiple devices RAM and ROM sizes, larger is most often better. Since RAM is where almost all data is written by the user, RAM is easily compared between devices of varying operating systems. In the case of ROM, some operating system may require more ROM, so a larger ROM does not always mean more available space. It is best to compare ROM's of devices with similar operating systems. Increased amounts of RAM and ROM will increase a devices price but will also increase the amount of information that can be stored on it and may increase performance. PDA expandability is becoming an even more important component as users wish to be able to add more memory and use new technology in their devices. Unlike desktop computers, the internal components like the processor, memory, and other hardware of the device cannot be changed or modified easily (or in some cases not at all) by the user. Expansion slots are the best, easiest, and cheapest way for memory and/or expansions to be added. The most common expansion slots found on devices are Compact Flash (CF), Secure Digital (SD), and Memory Stick. Some devices will include a multiple different expansion slots to increase the devices expandability. Different slots feature different size and style expansions. Compact Flash is the most common expansion type and has been around the longest. Because of this it has the most options available for expansion. CF comes in two different sizes that are referred to as Type I and Type II. Type I is thinner than Type II. Devices that support Type II CF cards (contain Type II CF expansion slots) also can use Type I CF cards, but a device with Type I cannot use type II (they will not fit). This is an important difference to note when purchasing expansion for a PDA and it is important to note that a PDA with a Type I CF slot may not be able to use every CF card on the market. CF memory cards come in sizes up to 3000mb (3gb). CF expansion cards offer wireless networking, Bluetooth, serial, USB, infrared, modems, cameras, and more. Secure Digital is a newer expansion type then CF, but has some issues that are important to note. SD is also sometimes referred to as Multimedia Cards, but SD has (or will have) added security features and is more commonly found. SD only comes in one size (which is less the half the size of CF), but comes in another "flavor" known as SDIO. SD can only be memory, but SDIO is an SD card with input output functionality. Input output functionality allows cards to feature expansions like network adapters and cameras. Unlike CF where all slots can use memory or expansion cards, SD slots can only use memory while SDIO slots can use both memory and expansions. This means devices that have an SD slot cannot use wireless cards, though if it is SDIO it is compatible with expansions like wireless cards. SD memory cards come in sizes up to 1000mb (1gb). SDIO expansion cards offer only Bluetooth. Memory Stick is an expansion type seen usually only in Sony products. The cards are similar size to SD but do not have the conflicting SD vs. SDIO aspect. Memory Stick cards come in sizes up to 256mb. Memory Stick expansion cards have not made it to the US though in other countries Bluetooth and GPS cards are available. When comparing devices with different types of expansion slots, it is important to consider what you might use the slots for. If you primary expansion would be memory, any type of expansion would be able to support this. If however you are looking to add other types of expansion, Compact Flash is often the most viable solution. Since CF is widely available and supported, finding expansion cards is simple. If you are only considering adding an expansion card in the future, a device with an SDIO would be a solution as many manufactures have shown interest in producing expansion SDIO cards. Usually, the type of expansion slot does not raise a devices price though it can increase its size slightly. Multiple card slots will increase a devices price and will also increase the devices sizes (usually thickness). Wireless solutions are available to get PDA's connected without the constraints of wires. There are three wireless solutions available, which enable users to break the wires and access computers, networks, and the internet. Though all these wireless solution can work simultaneously, usually a device can only utilize one or two because of the need for added expansion solutions which are not available. To decide on which wireless solution is best, it is easiest to look at what wired connection it will replace. Bluetooth is a short range wireless solution. Bluetooth is the wireless equivalent of USB (Universal Serial Bus). It is defined as short range because it only operates at less then 30 feet from another device. Bluetooth is commonly used for connectivity directly to a computer (for syncing) or between multiple Bluetooth device (like to a mobile phone). Bluetooth allows for a connection to the internet only through another device. This means, you must be connecting to a device that is on the internet. Some devices may include Bluetooth integrated into them so the need for an expansion card is not necessary. Both CF and SDIO Bluetooth expansions are available as well as some other formats for laptops and desktops. WiFi is a mid range wireless solution. It is defined as mid range because it only operates at maximum distance of 1200-1600 feet from another device. You might have heard of 802.11b before, which is one WiFi standard. Other WiFi standards are 802.11a and 802.11g. Some companies are touting an 802.11b+ standard but this is just a better performing 802.11b. Standards define how the wireless cards communicate. Some standards boast faster or longer range performance. Really, these are all generally the same thing, WiFi. WiFi is the wireless equivalent of Ethernet or a local area network (LAN). Like Ethernet, WiFi networks can be setup in a similar fashion or established networks can be accessed. Access points can be deployed onto a wired network directly (via a wireless router) or simply connected to a specific machine. WiFi allows for connection to the internet through an established connection. If the network (or computer) the WiFi card is connected to has an internet connection, the device can also use the internet. Some devices may include WiFi (most often 802.11b) integrated into them. CF WiFi expansions are the only way of connecting a PDA to a WiFi network though other formats are available for laptops and desktops. GSM/GPRS and CDMA are two long range wireless solutions. Both are based on the same technology used by cell phones. Because of this, you cannot set up your own GSM/GPRS or CDMA network but you pay a month fee to a data service provider (often these are just cellular service providers) for internet access. (Note that some data service providers use GSM/GPRS while others use CMDA.) In this way, GSM/GPRS and CDMA is the wireless equivalent of cellular data service (actually it is). Not only can these kinds of connections let you roam and access the internet, but in some cases and with certain devices you can also have voice phone service allowing the device to double as a mobile phone. Usually GSM/GPRS and CDMA is only available integrated into the device though in some cases CF expansions are available (and other formats for laptops and desktops). When comparing wireless solutions it is best to consider what you wish to access with your device. If you are looking to access another device or do local (close) synchronization of your device, Bluetooth is the best solution. If you are looking to access a network or many computers, WiFi is the best solution. If you are looking to have internet access anywhere you go, GSM/GPRS or CDMA are the best solutions. Bluetooth and WiFi expansions are usually cheaper then GSM/GPRS and CMDA solutions, and do not have the monthly fees. Unlike GSM/GPRS and CDMDA, both Bluetooth and WiFi networks have to be setup, installed, and configured by the user instead of a 3rd party. Hopefully, the time you invested reading this feature has paid off by increasing your knowledge of PDA components and how to decide which will be best for you. Remember, faster and more does not always equate to better. Better is only defined by how you will use the device, which is another area you should explore when purchasing. High School Tutor Perth . She tells about mobile phone data recovery services at this site. . Nuru massage midtown ella nuru massage.